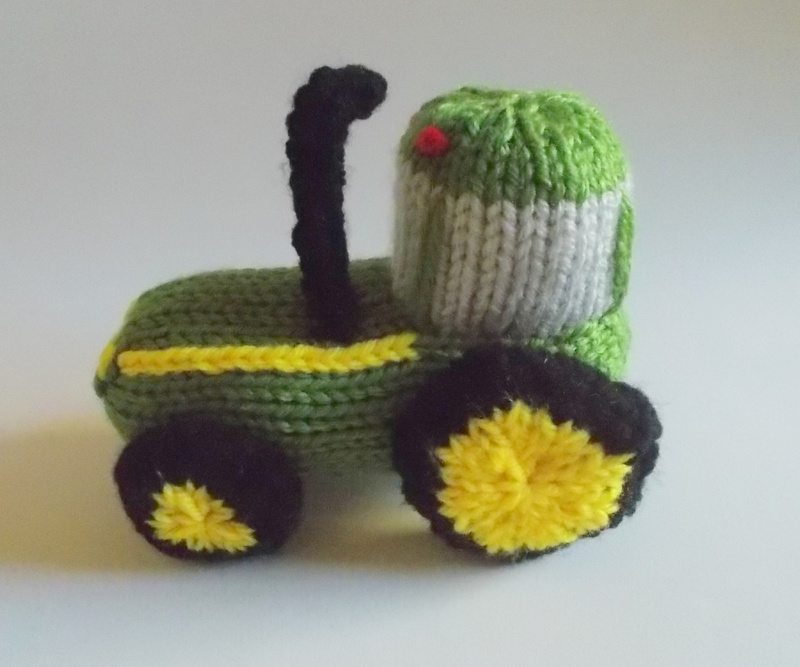 Many free toy knitting patterns are available on the Internet. Of monsters, alphabet, various shapes, food, plants, sports and vehicles. It takes time to sift through. I did it so you don’t have to. I hope you find something you like. 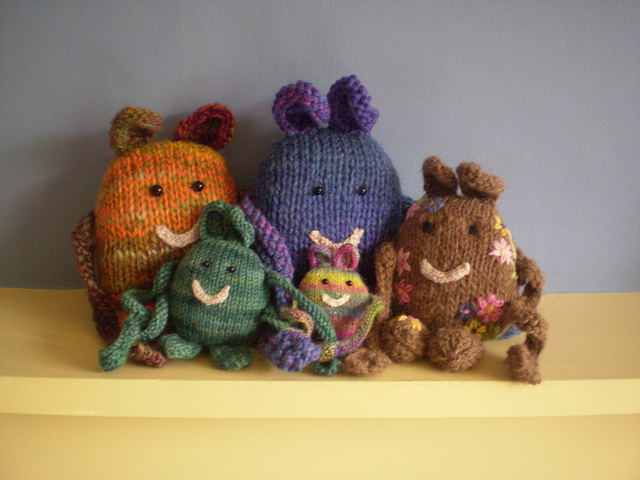 It is amazing how many knitted toys are animals and teddy bears. 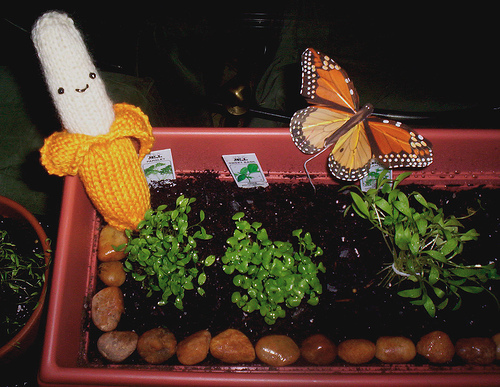 But there are so many other knitted toy ideas that I have come across. Since I already have separate lists for toy animals and teddy bears, I decided to create a page dedicated to only toy patterns that are not toy animals, teddy bears or dolls. Toys are usually knitted for kids or for those young at hear. And oh yes, for those who hate blocking. 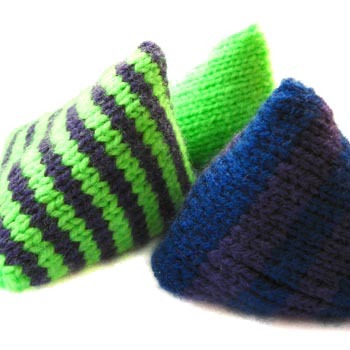 No need to block your knitted toy pieces as you will be sewing and stuffing them. 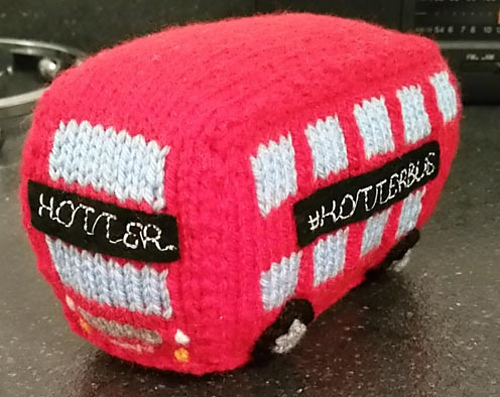 Knitted toys are great yarn busters as they often need only 50 yards or less. They are also quicker to finish. 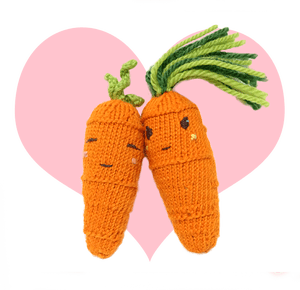 Knitted toys usually feature a variety of techniques for shaping such as short rows, increasing and decreasing, and because knitted toys are small projects, they are a great way to pick up these techniques without committing to a large project like a sweater, cardigan that take up more time. 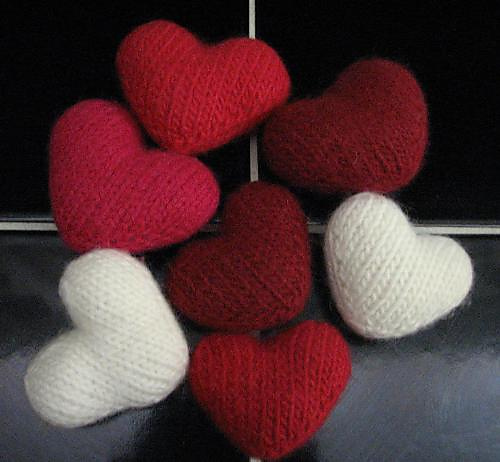 Ultimately, they make great gifts especially for non-knitters than socks, sweaters or scarves. You don’t have to worry about their sizes and their fashion preferences. All kids love toys especially cute ones! As you most often need to stuff these, it is better to knit a denser fabric. You do this by using smaller knitting needles then is recommended for the yarn. Some patterns would have already accounted for it and would state so in their instructions. Others may not. For example, Jean Greenhowe’s patterns. I noticed the stuffing is always showing through so I will use a thicker yarn or use double strands when I next knit her toys. If your toy is going to be used as a decoration, use cheap acrylic yarn. 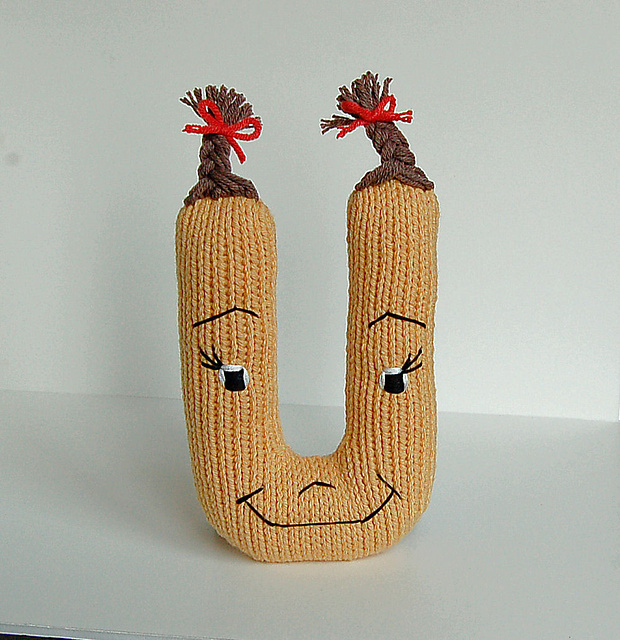 If it is intended to be cuddled and loved by a child, then I suggest soft snuggly yarns preferably cotton or linen. They should also be machine-washable. If the polyester stuffing is in big tight chunks, try to separate the fibres by teasing the chunks into smaller or thinner bits. For small spaces like ears, thin long legs, fingers and more, try to push the stuffing in with a small tool like a tweezer or bamboo skewers. The better stuffed your toys are, the better their shapes will be. If you stuff and shape at the same time, it will lessen the need to knead and tug at your stuffed toy to get it into its proper shape later. Stuffing is airy and light and does not offer any weight to hold the toy up. My first small toy was a penguin and it keeps flopping over. You can weigh down your toy with dried grains like beans, chickpeas or rice. Use any type of grains or beans but do choose rounded grains. Place them in water-proof bags like plastic pouches before putting them into your knitted toys if you plan to wash them. Wash and dry the grains or beans before using. My personal favourite is white rice. There are also plastic pellets that you can buy. Use cardboard or a firm fabric like stiff inserts for toys that have flat surfaces. Trim them slightly smaller than the surface they are for. Be bold with facial expressions. Decide how the eyes, nose, mouth are going to be made. Instructions in patterns are usually not that clear unless they are buttons, plastic eyes or noses or cut-out felt shapes. For toys meant for young children, choking is a major concern to make sure the items you choose to use are safe for kids. Embroidered faces are the safest. You get also get kids-safe plastic eyes and noses. Here is a blog post by Simply Notables on creating eyes and noses using needle felting and embroidery. Master these 5 tips and you are on your way to becoming the favourite adult. I am intrigued by this pattern. A heart knitted in the round. The shape is very good and it is a really plump heart. This pattern is downloadable from Craftsy. I really liked the quirky expression on this starfish. All the pieces are knitted in garter stitch and then sewn together. According to Amanda, this makes a fun bath toy. Dani designed all the letters of the English alphabet. She embellished the basic shapes with eyes, hair and accessories to give them quirky characters. I am intrigued by un-common construction. I am curious how Dani made the balls using garter stitch. The idea is quite simple after I saw the pattern. She uses a single colour for each ball, but I can see using 2 colours to give the balls more colour. The size of the balls fits 4 cm sized polystyrene balls using 4 ply yarn. Designed by Marcie Nishioka. This basic ball pattern can be used as a basic spherical shape for fruits. It requires the knitter to know how to knit into the front and back to make increases. 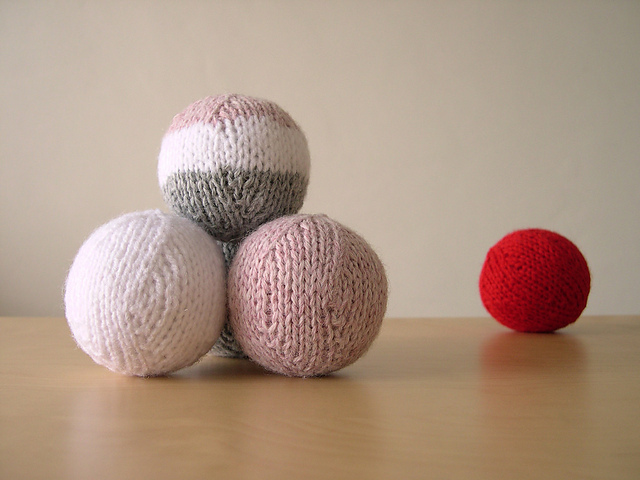 Vary the sizes of the balls by using yarns of different weights. 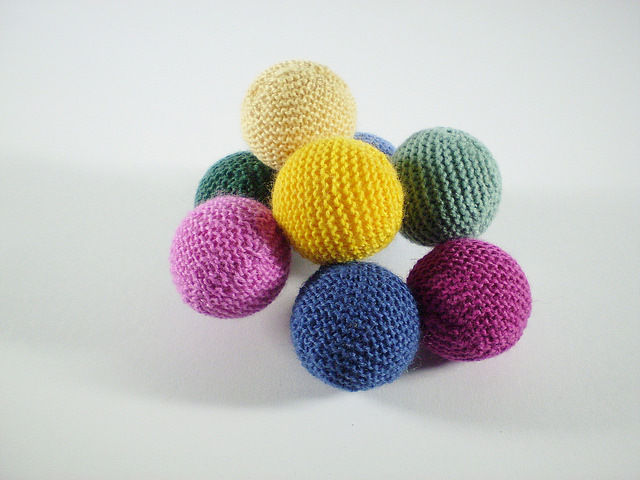 Imagine making these balls using yarns with variegated colourways. It would be so pretty. This juggling sack reminds me of 5 stones that I used to play as a kid. 5 stones are made up of cotton and stuffed with rice or sand. We don’t juggle them, we play a stone-throwing game. This juggling sack is also stuffed with beans or grains and not poly fiber stuffing. The mom called this a bunny but it is more like an awesomely cute 3D triangle so it is “filed” under Shapes. The instructions are accompanied by clear pictures explaining the trickier parts. The legs have a little turn making the bunny that much more unique. If you have always wonder how socks heel is made, this is a little peek. Designed by Sarah E. White. Knitted flat into a T-shape before sewing up to form the cube. 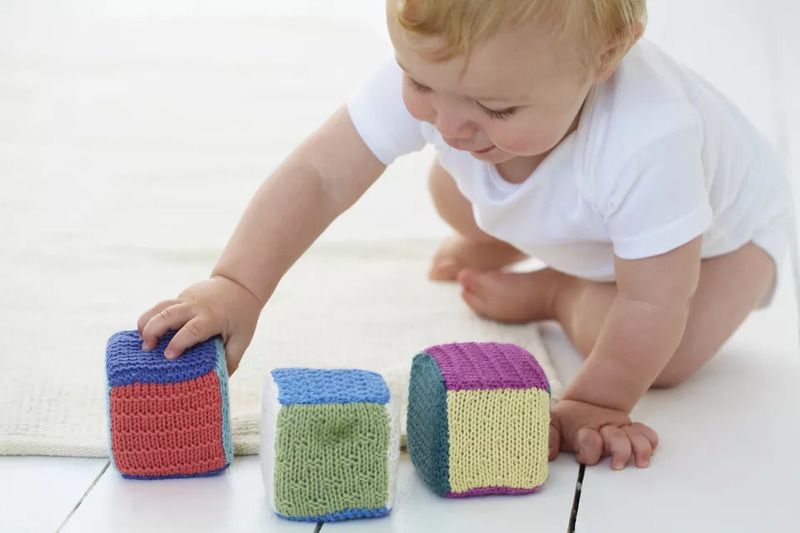 Sarah said that a set of these easy-to-knit baby blocks are more useful than a sweater because the baby grows out a sweater faster than a knitted toy well-used. I have to agree. I can see the fun variations by using different colours or even different knit textures. How about embellishments like embroidery or duplicate stitch? 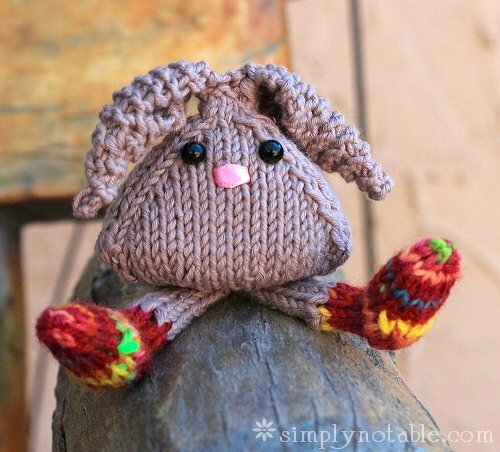 Rebecca dreamed up this little critter because she didn’t want to waste her leftover yarns. A girl after my own heart. I am always wondering what to do with that little bit of yarn left. Now I know. Frankie’s monsters are not scary at all. The size of your monster is determined by the weight of your yarn. I really like the one with flowers embroidered on its body. It’s the flower troll. 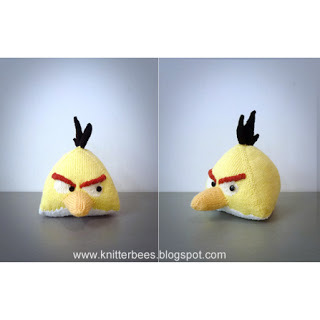 This is an excellent example of the yellow angry bird. It would make a nice gift for any child or adult who is a fan of the mobile game. Her red angry bird is also free. 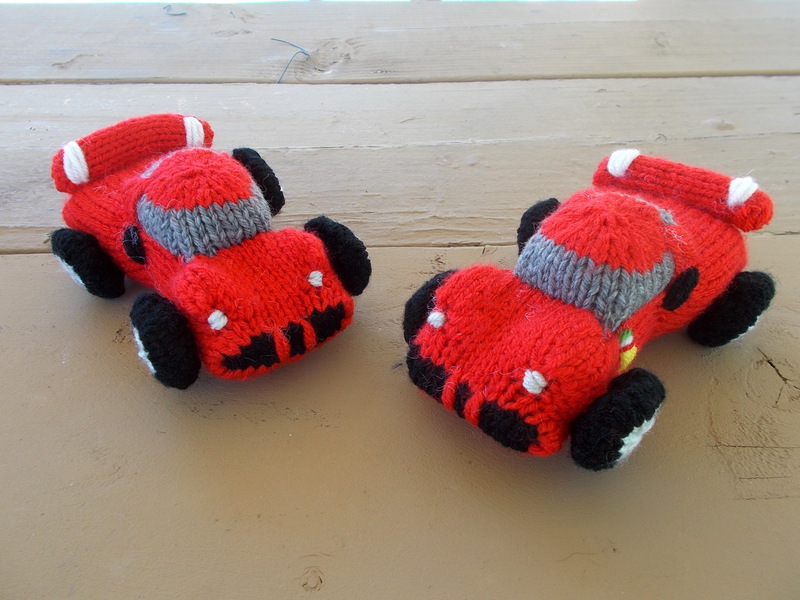 Knitted toy vehicles must be difficult to design. I can hardly find any free ones that are good. 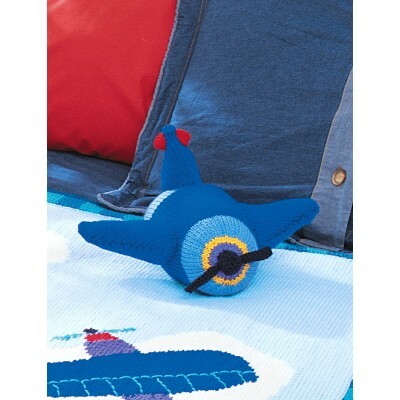 This is a cute little chubby single propeller plane knitted in Patons’ worsted weight yarn. This is an amazing pattern. Ilana puts a lot of work into this. There is quite a bit of sewing up but if you are into this sort of thing, it will be a blast and make a little boy very happy. I think this tractor is a little round. Ilana should consider using one of the my tips to use interlacing inserts to make the flat surfaces. But it is still a very cute pattern. These 2 patterns for carrots are the same except for the way the increase is done. The designer explained the main differences between the two. You need to be comfortable using double-pointed needles. This pumpkin is called perpetual because of the cables. 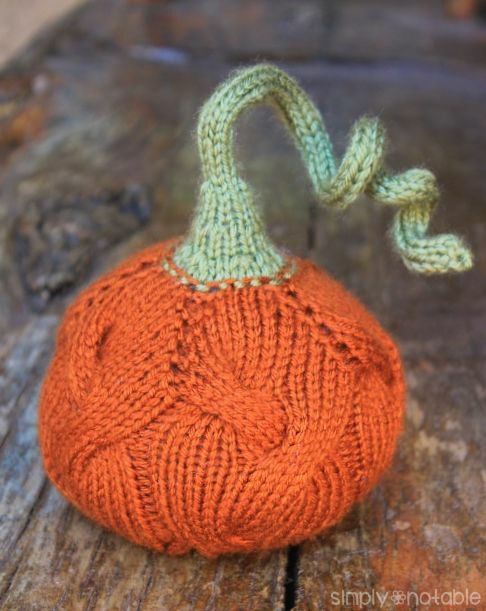 There are many knitted pumpkin patterns but I think this one is really unique. Knit in the round with barely any seaming. This apple looks straightforward. KFB means knit from the back or knit through the back. It reduces bumps on the skin of the apple. Shaped like a granny smith apple. The pattern contains instructions for 2 sizes. 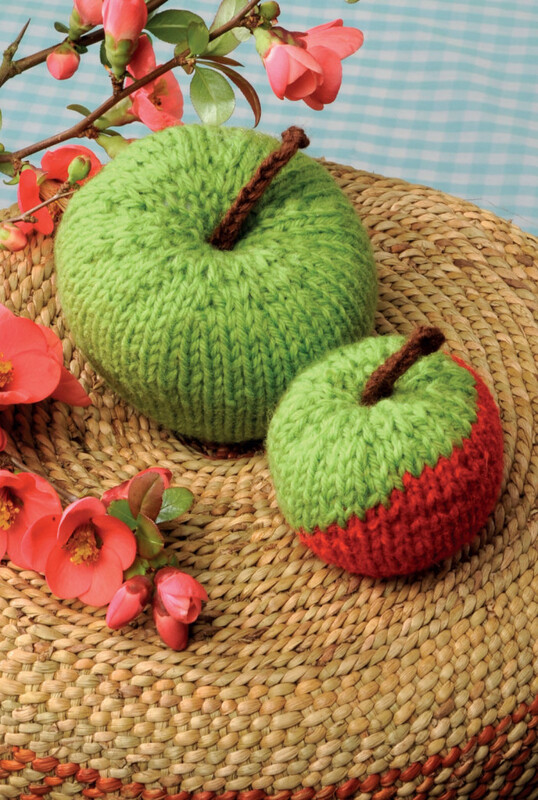 Knitting up both make up a nice fruit basket. 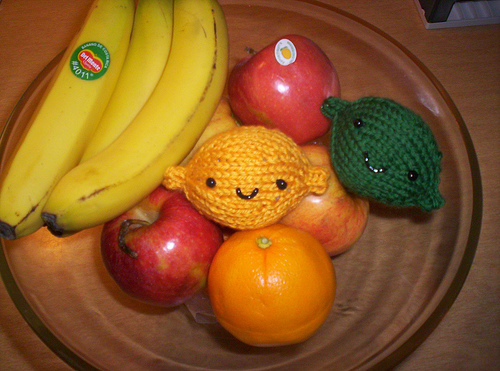 If you are planning to knit a fruit basket, do not forget the banana, although it is already half peeled. 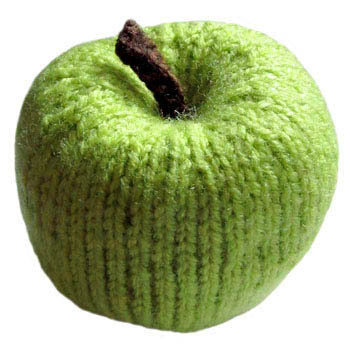 Alex at Peachcake Knits also have patterns for an apple, peach, pear, lemon and lime. l think her lemon and lime are really good. 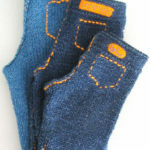 nice pictures at Ravelry. Alex’s lemon and lime patterns are very realistic. The bright yellow and green colours make a difference. I think they can also make effective stress balls. Imagine staring and squeezing bright green and yellow coloured balls with whimsical smiles. 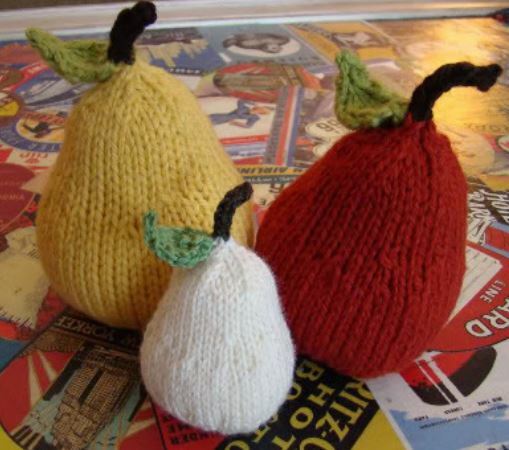 This pattern has instructions to knit a 3.5inch tall pear and a 2.5inch tall pear. Good yarn buster. Spud and Chloe didn’t add facial features to her pears but there is potential there. 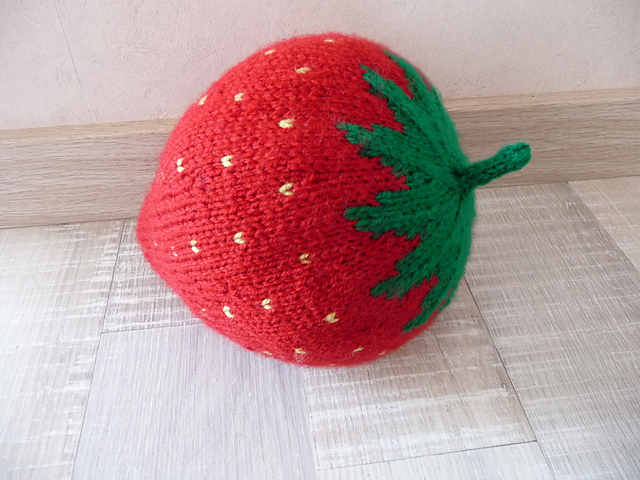 The size of the strawberry depends on the weight of the yarn you use. Patty recommends using smaller needles than the recommended one to create a denser fabric. I think it looks very good. Makes a good gift for little boys or girls. 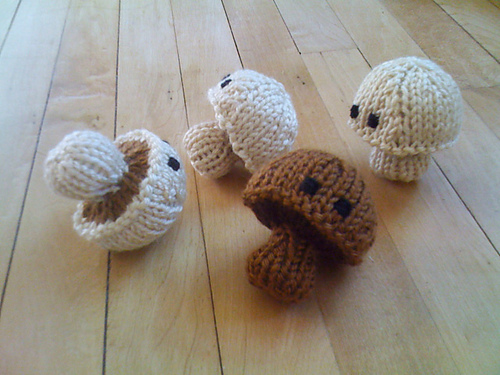 I don’t know why but I have such a soft spot for knitted mushrooms. Perhaps it is because I like to eat them. 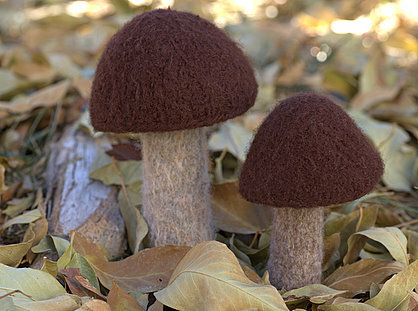 On a serious note, mushrooms are easier to design. 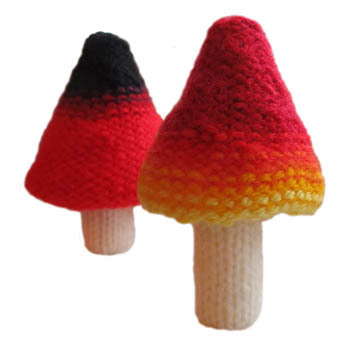 The caps are basically knitted circles and the stems are knitted narrow tubes. Grace offers 5 cap and 2 stem patterns for you to mix and match. The mushrooms are quite realistic. It is also a great project to learn how to felt. If you are going to substitute yarn, make sure you use pure wool and one that hasn’t been superwashed or else it wouldn’t felt. This pattern will make a 6-inch tall mushroom. There are instructions for a pair of eyeballs. I think they look quite scary for kids, so if you are planning to make this for a child, omit the eyeballs or replace with embroidered eyes. I like the way the white dots were made. Jessica did 2 things to help the shape of the mushroom. First, she used rolled up strips of paper to hold up the stems, creating straight firm stems. Second, she used a bit of wax on the bottom of the stem to create a flat bottom allowing the mushroom to stand. 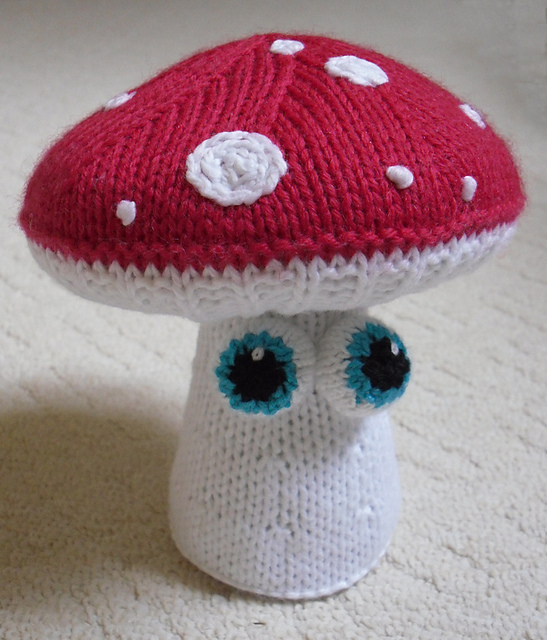 Jessica has 2 more mushroom patterns on her website. Let your sporty children can play with these squishy knitted balls before graduating to the real thing. This pattern reminds me of my garter stitch square bag pattern. My bag is made up of smaller pieces of squares sewn together to form a unique shape. 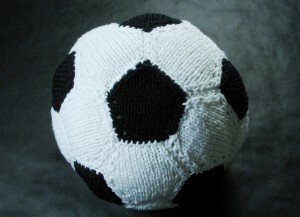 Here, a total of 20 white hexagonal panels and 12 black pentagons are knitted and sewn together to make the soccer ball. Yana’s instruction is quite easy to follow and, if you follow her gauge, you should get a life-size soccer ball. How cool. Here’s a youtube video of a project based on Yana’s pattern. 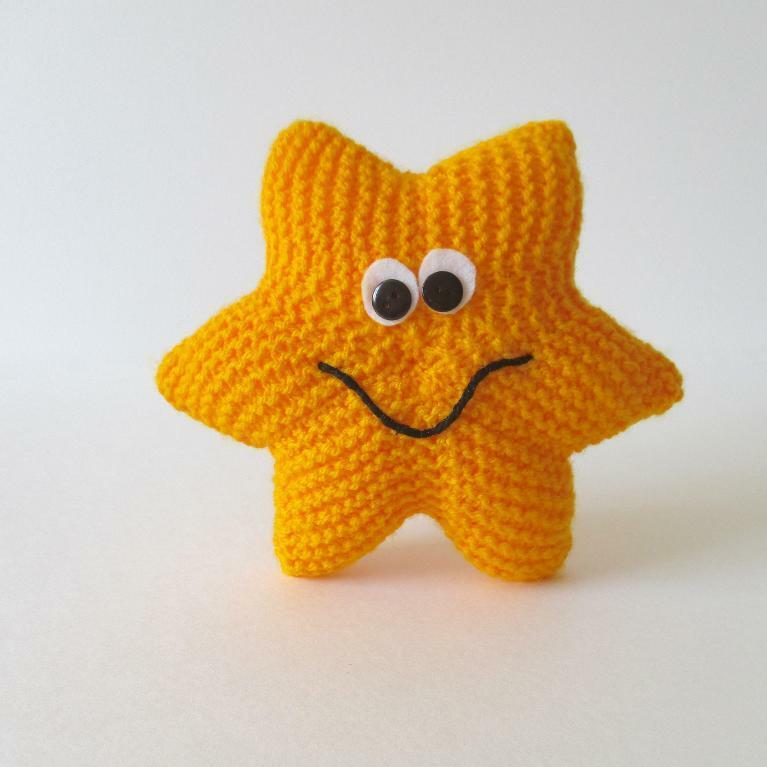 I hope you will find the free toy knitting patterns for monsters, shapes, alphabet, food, plants, sports and more listed here useful. Let me know by leaving a comment. 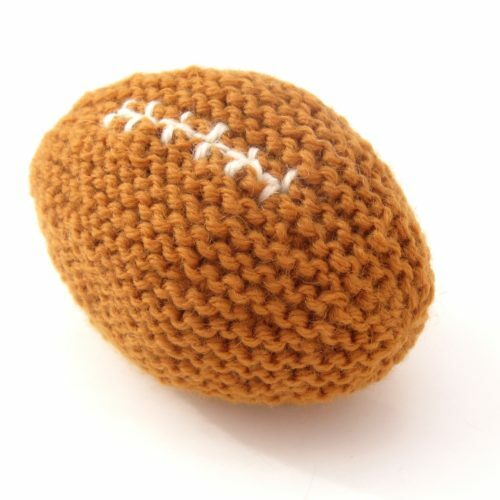 This football soft toy is tiny, only 4-inch from end to end. Suitable for a little baby. I consider it good for busting a small yarn stash. Need to know garter stitch and short row shaping.